Barron’s Cover Story 3/31/2008 Commodities: Who’s Behind the Boom? CHINA, AS EVERYONE KNOWS, IS A BIG FORCE IN THE extraordinary boom in commodities. Its voracious appetite for everything from corn and wheat to copper and oil has helped push up U.S. commodities prices by some 50% over the past 12 months. Index funds with buy-only strategies have had outsized influences on the market. Here’s the problem: The speculators’ bullishness may be way overdone, in the process lifting prices far above fair value. If the speculators were to follow the commercial players — the farmers, the food processors, the energy producers and others who trade daily in the physical commodities — they’d be heading for the exits. For right now, the commercial players are betting on price declines more heavily than ever before, says independent analyst Steve Briese. For example, in the 17 commodities that make up the Continuous Commodity Index, net short positions by the commercials have been running more than 30% higher than their previous net-short record, in March 2004. Briese, author of the recent book The Commitments of Traders Bible and editor of the Website CommitmentsOfTraders.org, was one of the first to recognize that information on the bets made by the commercials could provide rare insights into how the “smart money” views the price outlook. These days, the data suggest, the smart money clearly believes that the market’s exuberance has turned irrational. Indeed, the great commodities bubble started springing its first leaks two weeks ago: Oil, gold and other major commodities posted their steepest weekly drop in half a century. Though prices have since firmed, they could eventually drop 30% as speculators retreat. The only real question is when. 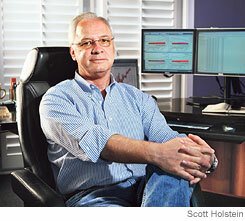 Analyst Steve Briese sees heavy short-selling by pros. IT’S NOT EASY TO SIZE UP THE influence of the index funds. But based on their known cash commitments in certain commodities, and the commodity indexes their prospectuses say they track, it is possible to estimate the size of their commitments in all commodities they buy. Using this method, analyst Briese (pronounced “breezy”) estimates that the index funds hold about $211 billion worth of bets on the buy side in U.S. markets. Applying a similar method, but with slightly different assumptions for indexes tracked, Bianco Research analyst Greg Blaha puts that figure at $194 billion. Either figure is enough to turn the index funds into the behemoths of the commodity pits, where total bullish positions now stand at $568 billion. Commodities index funds, which arrived on the scene in the late 1990s, have come into their own in the past several years. The biggest index fund, Pimco Real Return1 (ticker: PRTNX), has seen its assets swell to $14.3 billion from $8 million since its inception in January 1997. Index funds offer investors an easy, inexpensive way to gain exposure to a segment of the commodities markets or a broad-based basket of commodities. Result: The funds have drawn many private investors who have never ventured into futures, along with pension funds and other institutional players looking to diversify. But for all the virtues that the funds hold as a way of spreading bets across commodity markets, they take only long, or bullish, positions, avoiding short-selling. In other words, they trade on the naïve and potentially fatal assumption that commodities have the same tendency as stocks to rise over the long run. That this large, bullishly oriented group of funds is flourishing is partly a result of a regulatory anomaly. In recognition of the fact that the commodity markets are too small to absorb an excess of speculative dollars, the Commodity Futures Trading Commission, in conjunction with exchanges, imposes position limits on speculators. But the agency has effectively exempted the index funds from position limits. The dislocations caused by allowing so much money into markets that have limited liquidity is now causing alarm in the trading pits. That, in turn, is prompting the CFTC to call for an industry gathering April 22 at its Washington headquarters “to hear firsthand from participants to ensure that the exchanges are functioning properly.” On this and related issues, CFTC Acting Chairman Walter Lukken declined to comment to Barron’s. Unless regulators clamp down, the index funds could become an even bigger force in the markets. In the midst of the recent sell-off, commodity bull Jim Rogers made that very point in an interview with Bloomberg News. Referring to the “over 70,000 mutual funds in the world” compared with the “fewer than 50” that now invest in commodities, he held out the prospect of a speculative bubble that could last for years. IN THE ORGANIZED COMMODITY MARKETS, trading is in futures and options, which are essentially two-way bets on the outlook for prices. For every buyer (a “long”) of a future or options contract betting on a price rise, there is a seller (a “short”), taking the other side of the contract by betting on a price decline. Since speculators and commercials as a group can be either short or long, the charts (see the last page) track the net position — longs minus shorts — held by either group. Courtesy of Briese, the charts track net long or short positions in dollars, based on the dollar value of the commodity each futures or options contract covers. The speculators, now so bullish, are mainly the index funds. To see how their influence on the market has become outsized, just look at how they operate. Nearly $9 out of every $10 of index-fund money is not traded directly on the commodity exchanges, but instead goes through dealers that belong to the International Swaps and Derivatives Association (ISDA). These swaps dealers lay off their speculative risk on the organized commodity markets, while effectively serving as market makers for the index funds. By using the ISDA as a conduit, the index funds get an exemption from position limits that are normally imposed on any other speculator, including the $1 in every $10 of index-fund money that does not go through the swaps dealers. The purpose of position limits on speculators, which date back to 1936, is clearly stated in the rules: It’s to protect these relatively small markets from price distortions. An exemption is offered only to “bona fide hedgers” (not to be confused with “hedge funds”), who take offsetting positions in the physical commodity. The basic argument put forward by the CFTC for exempting swaps dealers is that they, too, are offsetting other positions — those taken with the index funds. Position limits on speculators, in some commodities specified by CFTC rules and in others by the exchanges, are generally quite liberal. For example, the position limit on wheat traded on the Chicago Board of Trade is set at 6,500 contracts. At an approximate value of $60,000 worth of wheat per contract, a speculator could command as much as $390 million of wheat and still not exceed the limit. But at least one index fund that does trade the organized commodity markets directly and must therefore abide by the rules — PowerShares DB Multi-Sector Commodity Trust (DBA) — recently informed investors that it was bumping up against position limits and therefore would change its strategy. No such information is available from individual swaps dealers. But based on CFTC data on their total position in a commodity like wheat, together with the fact that only four dealers account for 70% of all the trading from the ISDA, it is quite clear that if the exemption were ever rescinded, the dealers’ trading in these markets would no longer be viable. Speculators also use the older commodity pools, whose position is likewise tracked on the charts. The pools, open to sophisticated investors, are flexible enough to sell short as well as buy long and are subject to position limits. But since they are generally trend-followers, they will almost always go long in bull markets. Through most of the recent period, then, the pools have been adding to the price distortions caused by the index funds. Add the pools’ bets to those of the index funds, and speculative money forms 58% of all bullish positions. To get a further idea of the impact of these speculative bets, Barron’s asked Briese to measure them against production in the underlying markets. He calculates that in soybeans, the index funds have effectively bought 36.6% of the domestic 2007 crop, and that if you add the commodity pools, the figure climbs to 59.1%. In wheat, the figures are even higher — 62.3% for the index funds alone, and the figure jumps to a whopping 83.6% if you add the pools. Betting against them as never before are the commercials, who deal in the physical commodity. The CFTC provides these figures on index trading for only 10 commodities. 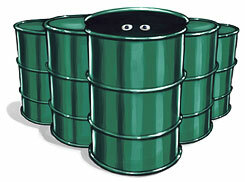 Why are such major commodities as crude oil, gold, and copper excluded? The agency’s rationale, which even certain insiders question, is that it would be hard to get reliable information on these other commodities from the swaps dealers. WHAT MIGHT FINALLY TRIGGER THE bursting of the commodities bubble? One possible trigger was cited in a Barron’s interview with Carl Weinberg of High Frequency Economics, published last week. Weinberg anticipated a break “some time this year” in industrial commodities, including crude oil, copper and natural gas once there is news of “even the slightest slowdown in the Chinese economy,” the country whose insatiable demand, together with that of India, has been a rallying cry of the bullish speculators. When industrial commodities prove vulnerable, speculative money could start fleeing agricultural commodities, also. But what if the U.S. economy proves more resilient than currently thought, doesn’t fall into recession, and instead starts growing again? The resulting rally in the stock market could send the allocation share back to zero and the bubble could burst, not with a bang, but with a whimper. The CFTC could also prick the bubble by enforcing its own rules. If the agency were to rescind the exemption on position limits given to the index funds (say, on a phased basis, so that the funds could make an orderly retreat), prices would probably fall back to reflect their true supply-demand fundamentals. Maybe it’s time to start listening to the smart money. This entry was posted in Commodity boom by sbriese. Bookmark the permalink.